A year on since I wrote about the plot of land that forms the western section of 'Creekside Village' being sold off to 'rental specialist' Essential Living there are signs that a planning application to Greenwich Council is in the offing. Earlier this month a 'public consultation' event took place at the Laban Centre - I wasn't able to attend but the boards from that event are available to view on the developer's website for your delectation. 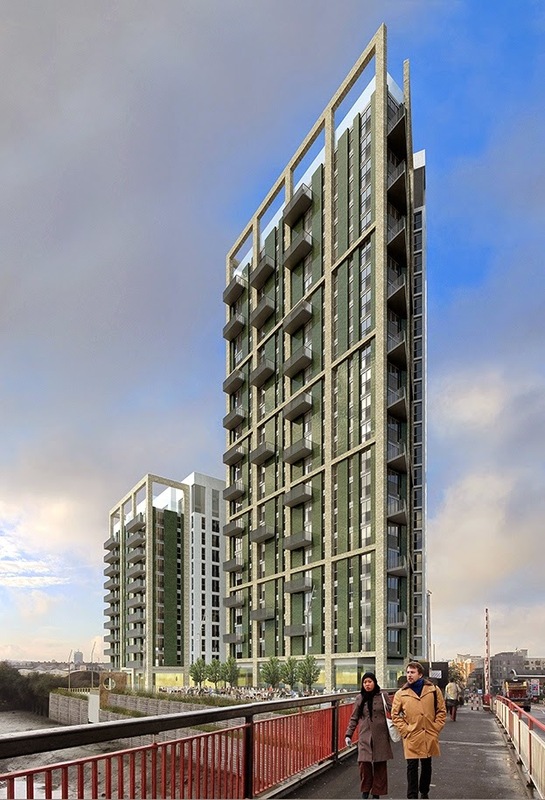 At the time the developer stated it was planning to develop two towers - one of 16 storeys and one of 11 - on the parcel of land within Greenwich Council's planning remit which borders Deptford Creek. You may remember that a previous planning application for a larger piece of land straddling the border was never approved by Lewisham Council although it was waved through by Greenwich's carefree councillors. It was with a weary sigh and a massive wave of deja vu that I read on the new boards that these towers have experienced a priapic surge with the 'landmark' building next to Creek Road thrusting skywards by another five floors, to more than 21 storeys. The two blocks will contain 249 residential units, all owned by the developer and rented out. Petty I know, but it's become something of a challenge for me, to read through these 'consultation' documents and display boards and work out how the marketing effort has been directed. Whether it's in terms of annexing all the adjacent green space to make your development seem more environmentally acceptable, creating renderings from particular angles to make your tall buildings look smaller, or using language that softens the harsh reality of a proposal. In the case of Greenwich* Creekside East it's a mixture of these, but I was particularly taken by the description of the two towers. They are not just described by the number of floors or the height, they are a 'tall, slender block of 21 residential levels' and a 'family block of ten residential levels'. From the angle in the image above you might debate 'slender' (definition: gracefully thin) but that argument doesn't pan out when you look at the other renderings and the actual plans. As regards the 'family block', from what I can glean it's a block of two and three bed apartments which is described thus because it has a nursery, 'grow your own' rooftop allotments, soft play area and 'Essential Living managed pets corner' (is this somewhere for dogs to poop or will it actually have animals in it? And if the latter, will there be staff to look after them full time or will the concierge just come and chuck a few carrots into the rabbits cages once a day, leaving them at the mercy of all comers the rest of the time? My mind boggles on so many levels at this concept..). The provision of additional communal storage on each floor and specific design aspects of the apartments such as large storage cupboards and oversized balconies are highlighted as other family-friendly benefits, but I can't help thinking these are fairly basic benefits that all apartment dwellers should have access to. In fact you probably need them even more if you are a group of single people or couples sharing a three-bed apartment because it's the only way you can afford it. Even the use of 'residential levels' is significant here, because it does not tell the full story. Both blocks have non-residential floors, so both will presumably be higher than the wording suggests. Crafty huh? The marketing rhetoric also claims that '72% of the site is external open space, including public realm and childs play'. I gazed at this plan for some time, trying to persuade my mind that this could somehow be the case. Perhaps the (residents only) rooftop terraces on top of the two buildings are being counted in this open space? 'Deceitful' is probably too strong a word but you get my drift. 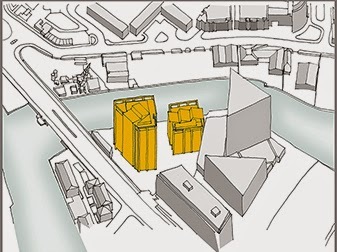 Meanwhile the graphic chosen to show the two new buildings in situ includes the tower in the previous (unapproved) planning application, presumably there to make the proposed structures look smaller. While you're looking at this image, don't forget to keep the word 'slender' in mind for the yellow building on the left. I know, it's tricky. Proposals for the public space at least have the potential to be a positive addition to the existing public realm in 'Creekside Village' which is sterile and unwelcoming. Public access to the banks of the creek should be a given for all developments along here, and ensuring that they are properly joined up, rather than being discrete sections of pathway that will be under-used because they don't lead anywhere, should be a long-term goal for both planning authorities. Intertidal terracing is proposed on the creek to provide a range of different habitats for plants, birds and so on; I don't profess any detailed knowledge of such matters but at least it seems to be thoroughly considered and in tune with what the Creekside Centre considers appropriate for new developments on the creek. I suspect the building heights are another matter. * Yes I know. Fight it out among yourselves. Update: In the comments Marilyn has pointed out that the land on the Lewisham side of the boundary is also being brought forward for redevelopment with developer Kitewood branding it Creekside Future East and posting notice of 'public consultation' events on 10 and 12 January at the Laban Centre. They have clearly been taking soundings locally since the current website makes no attempt whatsoever to claim that the site is in Greenwich - of course this could well be swept away when the marketing starts. 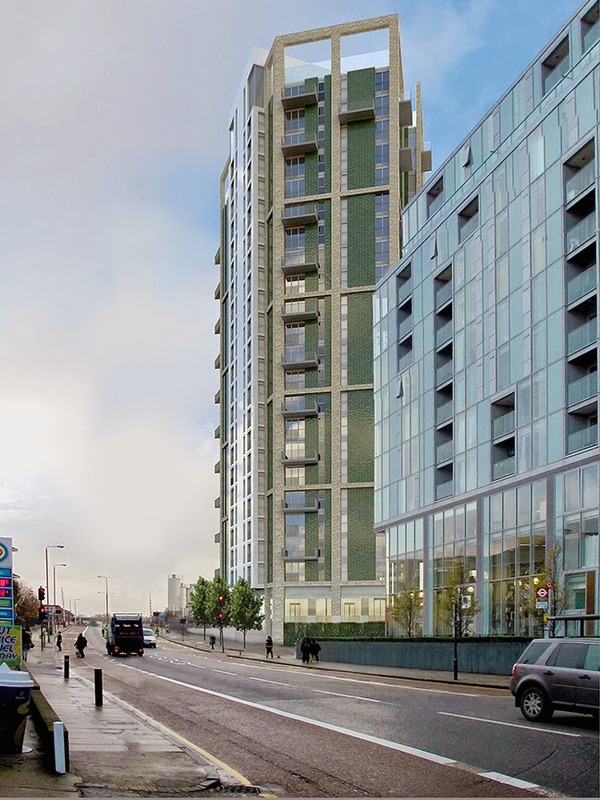 From the renderings on the website it looks as if they intend to put forward a carbon copy of the proposals that were previously approved by Greenwich Council but not by Lewisham - whether attitudes among the planners have changed since the original application remains to be seen. If both schemes are approved in their current forms, it will make for a very disjointed and discordant collection of buildings along the creek - you would hope that some degree of collaboration between the two boroughs can be achieved. Unfortunately it seems unlikely, given than the two boroughs are already in disagreement over whether environmental impact assessments are necessary for the two adjoining sites. 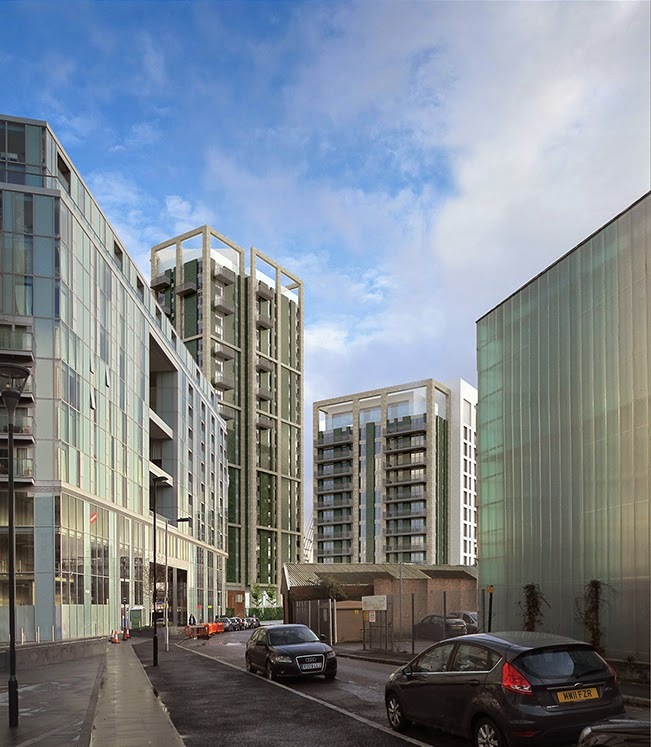 Greenwich Council is applying the relevant planning guidance in its most basic form, saying that the Creekside East site is not big enough in area to require an environmental impact assessment. Just over the border, Lewisham Council believes an EIA is required for Creekside Future East, given that the development proposes a significant change in intensity of use on the land, the fact that it is likely to be contaminated land which poses a potential risk to Deptford Creek, and taking into account the cumulative impact of other developments in the area. Hmm, as you were then. I went to Essential Living's public exhibition for Greenwich Creekside East at the Laban on 6 December. This one's going to be "The future of renting" apparently, according to the marketing messages. Now another flyer through my letterbox, this time it's for Kitewood's Creekside Village East ("A new development for Deptford"). Two separate developments, both along the same side of the Creek, both looking so similar on the CGIs I'm struggling to spot the difference. Websites for each of the developments: www.greenwichcreeksideeast.com. The other: www.creeksideeast.co.uk. Samey, but not. Anyway thought I'd mention that there's a public exhibition for Kitewood's Creekside Village East, also at the Laban, on Sat 10 January (12 to 4pm) and Mon 12 January (2 to 8pm). Thanks Marilyn, I've now updated the post to reflect that additional information. Seems they are simply proposing high-spec apartments that will be rented from by a single entity, rather than bought by individuals and rented separately. I can't see how this lack of competition will benefit the tenants and there's nothing to suggest there's any greater security of tenure or protection against unfair rent increases, which is what tenants really need. Also, I believe, the Kitewood site may have a section 106 for another footbridge over the creek. The canyonisation of the creek proceeds apace. This extension of the already soul-sapping grey reef will darken Creek Road once and for all. The biggest concern is the reason Greenwich planners will pass this like a shot......Priors Aggregates Wharf, a protected wharf they'd give their eye teeth to get rid of. They've wanted to for years, they tried to get it located to the Deptford side upstream 20 years ago. This is in spite of the fact that the operation keeps hundreds of truck movements off the roads. All it will take now under our present laws is a few noise complaints from the new residents and an environmentally sound employer will be gone. Sorry but I have to side track for a moment..."environmentally sound employer" - do you know how polluting cement dust is??!?!! And it is based so close to the primary school on Creek Road. Sorry, but I'll not lose any sleep if this factory moves out of the area. Too much development without consideration of infrastructure. Its hard enough to get in a train or a doctors appointment now. The area needs development but does it have to be that big? Dame, do you happen to know if either of these developments have opened up formal consultations yet? Would we need to send our views to both Greenwich and Lewisham Councils - or to Greenwich for the Essential Living one and to Lewisham for the Kitewood one? I brought back a feedback form from the Essential Living exhibition but its written by EL, has to be returned to EL and its questions feel slanted towards supporting that development. @Marilyn the formal consultation does not start until the developer lodges a planning application with the relevant local authority. At that stage you should make your comments to the planning officers AND copy them to your local councillors to make them aware of your thoughts. At this stage the developer is only 'consulting' with the local people in order to get responses that they can use as evidence of support in advance of their application. Which is why feedback forms so often seem to be written that way. I usually avoid all the leading questions and use the 'any other comments' box to give my feedback. @anon 09.54 there is a much bigger threat to the health of children in the school and much of the south east; nitrogen dioxide from the traffic on the road right alongside as can be seen from the Silvertown Tunnel campaign research http://www.silvertowntunnel.co.uk/our-study/2014-silvertown-tunnel-pollution-study-results/. Closing the concrete plant would add to that traffic as concrete would have to brought from much further away. If cement dust is posing the risk you believe (perhaps monitoring is required to establish if this is the case?) then enclosing the plant or installing equipment to prevent dust reaching the outside air would surely be a better solution. With major schemes nearby due to begin construction imminently, such as the Thames Tunnel, Convoys Wharf, Faircharm, and the developments mentioned here, surely it makes more sense to minimise the traffic pollution by reducing the distance concrete wagons have to travel? I see the "Greenwich" Creekside East consultation is being run by Michael Stanworth at Curtin & Co - his last job was as borough organiser for the Labour Party in Greenwich. If this site previously had permission to build this high to allow them the money to fund the bridge, now that they split the land and the bridge is no more, should the heights not actually be lower rather than higher as they no longer need to find the money to build it. 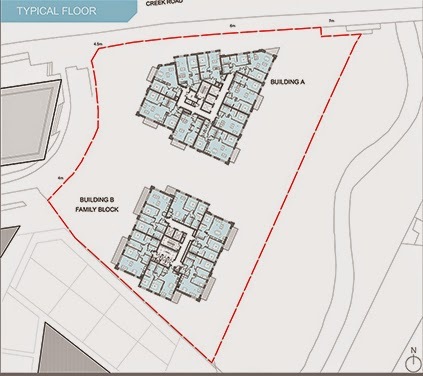 Plus the initial cost viability would have been done when prices were commanding £450 per square foot - they now range £550 - £750 so even more reason that they do not need the extra floors to warrant the development costs. I know I have seen some comments on your blog in the past and in some of the marketing literature but have the council come up with an overall plan as to how people will get in and out of Deptford now we have roughly 7 or 8 new rather large developments underway bringing a lot of new people into the area (or in Convoys Wharfs case -huge)? Are we going to get any new buses? Any new trains? Any new roads (or perhaps even some road maintenance would be nice), and new bridges or tunnels aside from Silvertown? Convoys Wharf have to pay for a new route and divert/enhance the 199 for 5 years. Also enhance 47/188 during peak hours. Can't come soon enough if you ask me. Crossrail should allow my room on the trains at Deptford as hopefully (fingers crossed) most of those out there move to it. I don't think any of this above is enough though. @tim for large developments part of the planning application should include a transport planning report which is supposed to assess the impact of the development on the local transport and roads. Then once the planning application is approved, the developer makes a contribution towards its impact on local services, through the Section 106 agreement and latterly the Community Infrastructure Levy - the money is supposed to be used to pay for improvements or new services. Some of this will go to TFL so that it can put on a few more buses or, ooh I don't know, build a garden bridge or something. As Darian says TFL predicts many of those currently using the trains through Deptford who come from Woolwich and beyond are expected to switch to Crossrail once it opens, but there is inevitably going to be severe overcrowding for the next few years, especially once the Deptford Project is occupied. lets work together to oppose this 21-story building. it will be a nightmare for deptford creek. Yes, that'as right aaron - let's be selfish and reduce the number of homes for people to live because London has far too many properties already and I don't want my journey home be more crowded. With finite land, I'm afraid nimbys will have to realise that the only way is up and we can no more build little houses with nice garden for the dogs to play. London is an international city not The Cotswold's. its not home for londoners. its built for private rent, not for sale. This building(more than 21 stories) is just around 300 yards from historical greenwich town centre,which is in the unesco world heritage. Are you sure it must be as tall as this? The buildings around it are all no more than 15 stories. I wonder how many people complaining about Priors moved there relatively recently, knowing it was already there? It's been there a long time and provides rare non-retail jobs. We have to have have some industry and jobs, not just endless new flats. If anything the council is at fault for letting dense residential areas spring up around it. This monstrosity got planning permission in October 2015. It is such a shame how Creek Road has changed. The mature trees are gone forever and now we are left with a high rise hell of tower blocks. Lewisham and Greenwich councils have used this area badly with too much high rise high density developments. Future new residents - it is awful living near Creek Road, be warned!